Apologies for the long absence. In the interim, I got married to the lovely Natalie Funk. And bought a condo in Metrotown in Vancouver. And have been teaching mobile app development. And will soon be teaching mobile web development and motion graphics at the Emily Carr U of Art and Design. It’s been a time of a lot of change and, additionally, a lot of retooling. I’ve been learning mobile development this and mobile development that. Lots of new tricks for this old dog. I put a couple of things together last week that I’d like to show you. 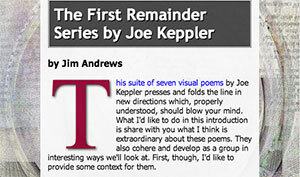 I published seven visual poems by Joe Keppler back in 2008. I always liked them and thought them special, but since I published them, I’ve given them deeper thought–and wrote something that gets at what, to me, is so remarkable about these poems. I also recoded Joe’s visual poems into HTML that displays well on mobile devices. I’ve been reading about “responsive web design” recently in preparation for teaching a course on mobile web development. Basically, “responsive web design” is about making web pages that work well on really a very wide range of display devices from big TVs down to smartphones. Joe’s poems were excellent practice in responsive design because they are varying degrees of simple but take up the whole page. Recoding these pages into contemporary HTML has helped me a great deal with my understanding of contemporary web design.